Let me state up-front that this is in no way a performance comparison piece. 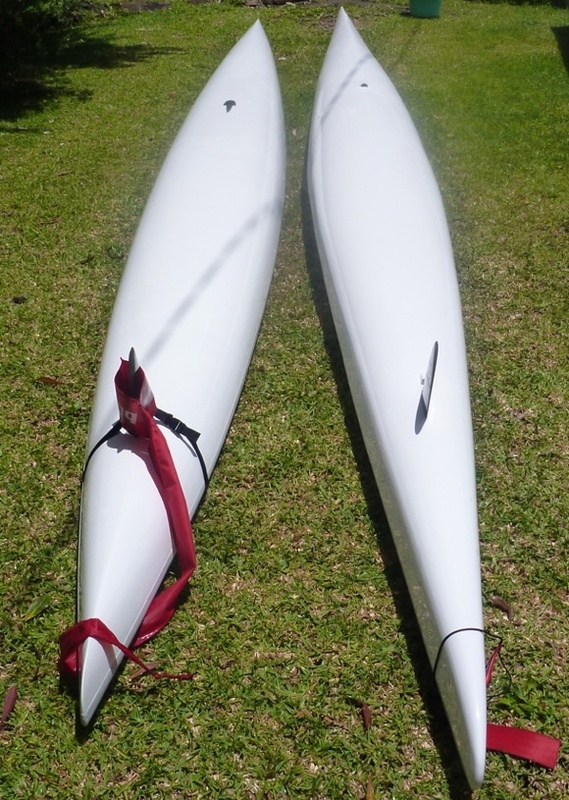 This is simply a visual comparison of the two surfskis that Nat and I are training on for the Mauritius Paddlers challenge ahead. We are two relative newcomers to the sport and have no basis of expertise whatsoever – ha! First thoughts – damn, those racing stripes look cool. But orange?? 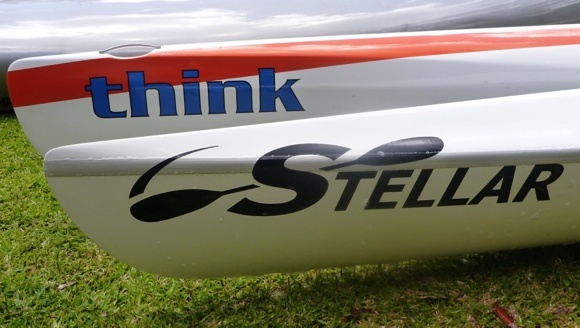 When looking at the two boats upside down, you can see the real difference in shape between the two surfskis. 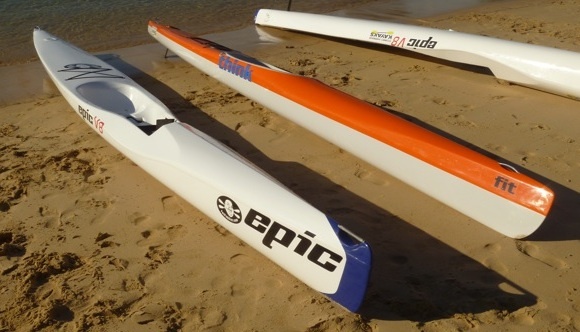 The Evo maintains its full beam at the paddler-point but very quickly tapers front and rear, making the ski look narrower than the SR. 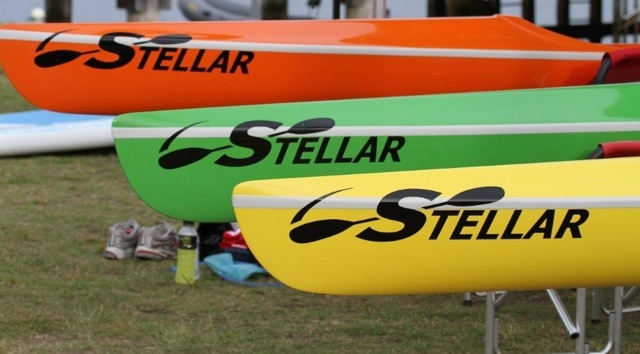 The Stellar maintains more volume throughout the length of the ski, most likely making it both more stable and able to contend with bigger paddlers, which the capacity difference proves. In the cockpit there are quite discernible differences. The Stellar SR has quite a roomy, boxy cockpit that takes up almost the entire beam of the boat. The Think Evo II has a tapering cockpit that narrows into the footwell. I’m guessing this keeps your legs together for more drive and means less water in the cockpit if you tip it over (Nat would know!). The wider roomier cockpit of the Stellar SR is more accommodating to the, er, “wider” paddler, with considerably more room for both arse and legs. The wider footwell also means you can spread the legs a touch, which adds a little stability. The foot-plate set-up is quite different on the two skis. 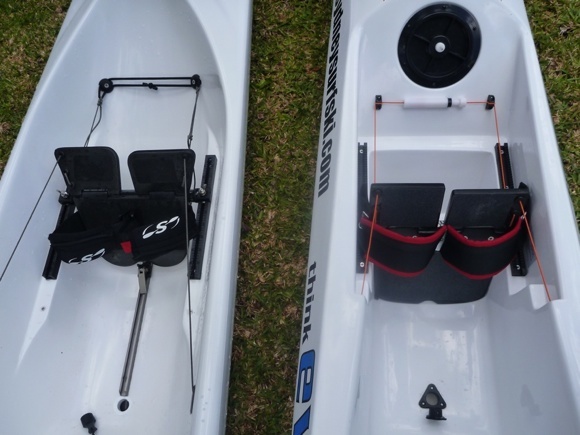 Whilst the Evo has a fairly standard two-point securing system, the Stellar SR has a three point system that I’ve been told has been taken from rowing shell design. It’s easy to adjust and is very secure once locked in place. Both skis feature individual foot-straps rather than the single strap favoured by some other brands. 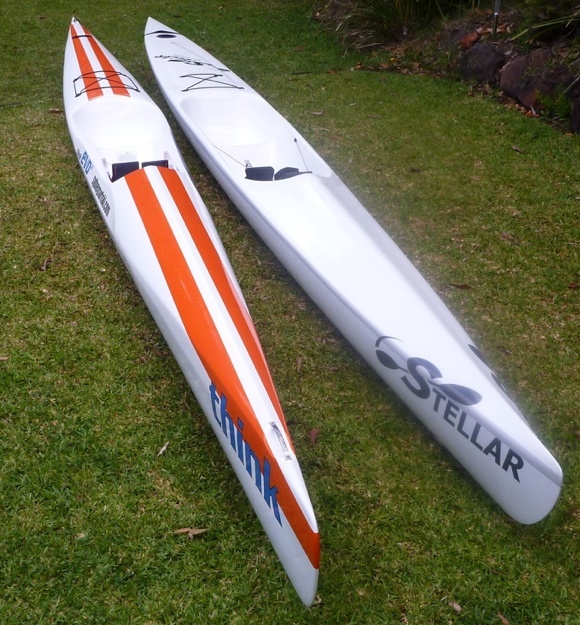 The Stellar SR and the Think Evo II – two great surfskis for two average paddlers! In all you have two fairly different skis. The Evo II is longer and tippier but has a very fast profile to it. The Stellar SR is shorter and has more width along it’s length for added stability. 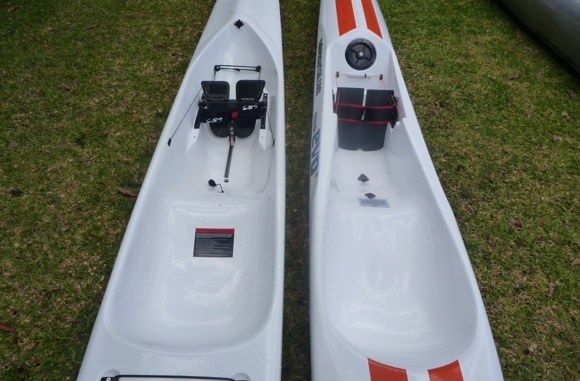 For Nat and I however these skis are great for our individual needs – for a Fat Paddler, Nat is a lightweight at sub-90kgs and the Evo is great for his smaller stature. 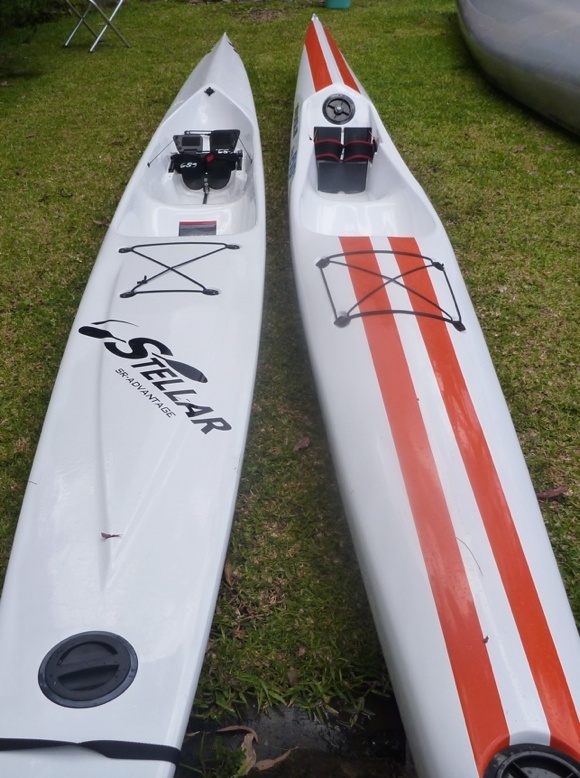 For myself at sub-130kgs, the extra room and stability of the Stellar SR makes surfski paddling accessible and gives me a great platform to build my skills at this new style of paddling. Very nice boats, wouldn’t mind upgrading from plastic to one of them! 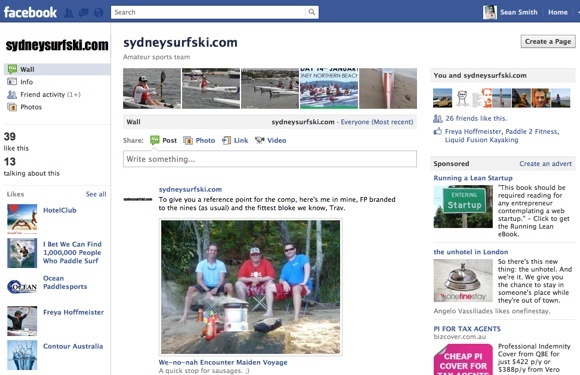 Unfortunately I am not on Facebook (and never plan to be) so cannot enter the comp.